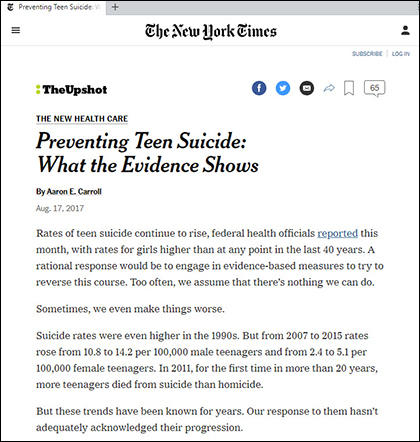 Suicide is the #2 killer, after accidents, of young people aged 10 - 24, of those in junior and senior high school and college. More young people commit suicide than die from cancer, heart disease, AIDS, birth defects, stroke, pneumonia, influenza and chronic lung disease COMBINED. More than 100 young people kill themselves every week. ONE out of every TWELVE students attempted suicide in the PREVIOUS 12 months. The Sunday New York Times put a spotlight on two of those deaths. Graham Burton hanged himself at Hamilton College in his sophomore year. The college's president sent a note of condolence, which Mrs. Burton appreciated. But then she read her son's journal in which he said he was flunking three of his four classes, and called himself a "failure with no life prospects." He had struggled to sleep, missed classes and turned in assignments late. The college knew of his difficulty, he wrote, but had been slow to offer help and understanding. Professors at the college in upstate New York had expressed concerns about Burton and knew he was in deep distress. More than a month before his death, his adviser, Maurice Isserman, wrote the academic dean, the strongest of many warnings: "Obviously what is happening here is a complete crash and burn. I don't know what the procedures/rules are for contacting parents but if this was my kid, I'd want to know." However, college officials say they are constrained by the Family Educational Rights and Privacy Act, or FERPA, a federal law governing student privacy. Hamilton College cited the law as the reason the college had not contacted the boy's parents. The law views students as adults and bars parents from student records - even grades or a transcript - without the student's consent - though parents are paying tuition. As the NY Times put it, "Colleges use the law not only to protect students' privacy but also to shield the college from conflict with parents." Yikes! This law is a major reason for the high suicide rate among students. Sadly, there is no interest among colleges and universities to do so. The American Council on Education, the largest national organization representing higher education, has never considered such a step, nor will it do so, according to spokesman Jonathan Riskind. However, the headline of the New York Times story was "His College Saw Despair. His Parents Didn't Until It Was Too Late." Olivia Kong, a junior at the University of Pennsylvania, told an on-call psychiatrist that she was thinking of killing herself, according to a lawsuit filed by her parents against Penn, where 14 students have committed suicide since 2013. Later that day, the girl filed an electronic petition for late withdrawal from her class, writing, "I have had thoughts of suicide." That weekend, she went home to her parents who live nearby. She spoke to the same on-call psychiatrist, who outrageously told her, "The cost of an E.R. visit is likely less than cost of funeral arrangements." He added that she said "she had actually planned to return to campus and kill self." Her concerned parents even visited her to check on her at midnight. The next morning Ms. Kong walked into the dark tunnel of a commuter rail station, and lay down on the tracks, and was run over. "We still feel shocked," her mother said last month. "The University, they know everything, but they didn't tell us anything." In the case of Graham Burton, three of his four professors, his adviser and the academic dead had exchanged emails about his frequent absences. The three professors submitted four academic warnings. Clearly, the university should have picked up a phone and called the parents. Penn's staff should have expressed their concerns to Ms. Kong's parents. That might have saved two lives. Mrs. Burtons wrote the college president, "I would have been far more aggressive in getting Graham the help he needed." Still grieving more than a year later, the Burtons wrote an open letter to the Hamilton College community in March. Noting that a second student's suicide nine months after their son's, they wrote, "We do not believe the college has done enough in the wake of our son's death to safeguard other students." They asked for a mandatory process to notify parents "in circumstances where a professor, coach, adviser...has concerns about a student's well-being." These colleges are complicit in the death of many students and should be sued by parents. Parents should also try to change the law.